Walking through the hustle and bustle of a farmers market, it may be difficult to pinpoint those fresh strawberries or that bottle of olive oil that you need. With so many long lines, much time is wasted. A new app has come to the Central Coast of California that makes it easier for consumers to find and buy locally sourced products. The app is called Arkitu and was first launched in February of this year but has been fully modified this past month. The word “Arkitu” comes from the Basque language meaning “find it”. The Arkitu app allows consumers to browse all of the farmers markets in the San Luis Obispo area. The app provides a list of the various participating vendors, as well as the products they will be selling at the market. Consumers can find specific products at each market by locating the pins the vendors have placed on the map. Payments for products can be made through the app as well. The vendor and consumer simply need to link their bank accounts to the app. Arkitu was founded by 24 year old Cameron Sluggett. Sluggett who is originally from Oakdale, California and was drawn to San Luis Obispo’s agriculture, technology and startup culture for his new app idea. “SLO also fits the perfect demographics for Arkitu with the socio economic and behavioral characteristics aligning with Arkitu’s target audience,” said Soren Dickens, a current business student at California Polytechnic State University at San Luis Obispo. He currently is the digital marketer for Arkitu, and long-time friend of Sluggett. Sluggett was at the San Luis Obispo farmers market in August 2017 when someone mentioned to him the SLO HotHouse, an incubator for startups to grow, created by the Cal Poly Center for Innovation and Entrepreneurship. Sluggett had never heard of it but decided to apply. He was accepted and has been working on Arkitu at the HotHouse since January, 2018. “I think a lot more people would go to support local markets if it was easier for them to do so,” said Sluggett. Sluggett’s main goal with Arkitu is to shift people from shopping for their food from large companies to buying local. He wants to help local growers increase their sales by helping consumers get locally sourced products. “I think this app will make the farmers market a lot more convenient for people because a lot of time is wasted looking for the products you want but not knowing where they are,” said Jessica Sharpe, a journalism student at Cal Poly SLO. Sluggett’s other goals with the company are to educate consumers on where their food comes from through social media and to create connections between the local growers and consumers at the markets. Farm sizes are increasing each generation, however, the number of farms are decreasing. According to the American Farm Bureau, only two percent of the United States population is composed of ranch and farm families. That being said, much of the population may not know the processes of how their food got to their plate, or what it is like to live on a farm. “The ability to have an app that connects consumers face to face with the growers is a really interesting and innovative and I think that it is a positive thing,” said Scott Vernon. Vernon currently teaches in the Agricultural Communication and Education department at Cal Poly with a PhD in agricultural education. He is an award winning writer for several national agriculture magazines and is also a professional speaker at various conferences and conventions relating to agriculture. “People are bombarded every day through social media and other forms of media about food production that is oftentimes is misleading and downright false,” Vernon said. Another problem that some growers may run into, as a vendor at farmers markets, is the increasing amount of people who don’t carry cash. This is a problem since many growers only accept cash at markets. A study done by the U.S. Bank found that 50 percent of Americans carry cash on them less than half of the time they go out and 76 percent of that 50 percent carry less than $50 when having cash on them. Sluggett saw this trend of people not having cash on them and thought to add the payment portion to Arkitu. When purchasing products from Arkitu, consumers have to pay fees of 5.8% of the transaction as well as $0.60 for purchases over $3.00. “If a market is selling a burrito for nine dollars and the consumer pays through Arkitu, the vendor will be receiving nine dollars,” said Sluggett. The fees that consumers have to pay go directly to Arkitu and do not affect the vendor. “Many people ask me, ‘why would consumers want to pay these fees?’ yet this concept has already been proven since consumers do this every day through apps such as Uber and Joyrun,” said Sluggett. The consumers can even order their desired products ahead of time. If they choose to do so, they just have to go to the vendor, show their receipt, and pick up the product that they purchased. Sluggett is still working on gathering vendors to join what he calls the “Arkitu movement”. The vendors have to follow three steps to set up their account on their app. They first have to add their location to the map on Arkitu, list their menu items with pricing, then connect their bank account to the app. To date, Arkitu has gotten vendors such as Julia’s Juices, Gracious Greens, Central Coast Meats and others to sign up. Occasionally at the markets, Arkitu will do promotions for the company to help vendors increase their sales and talk with consumers on the benefits of downloading their app. For example, at the Thursday evening San Luis Obispo farmers market on May 17th, Arkitu teamed up with Atsa Foods, a local Cal Poly start-up that sells Native American Superfood bars. If a consumer was to buy a bar through the Arkitu app, they would get another one free. In the upcoming months, Arkitu hopes to gain more vendors on the app and have more promotions at the markets. To educate consumers, Arkitu will be interviewing different growers around the area and will publish stories about them on their social media accounts. From Basque to English, “arkitu” translates to “find you”. As an app, Arkitu was developed to help you find exactly what you want at “dynamic markets”. The app allows farmers to create unique profiles that enable shoppers to easily locate vendors at farmers’ markets. Arkitu Founder Cameron Sluggett has built a tool to streamline communication between shoppers and farmers. In this way, he hopes to facilitate conversation about where your food comes from and shine a light on the people who grow it. Sluggett believes our country is built on farmers and does not feel they garner enough credit for their contributions. He aims to bring more people to farmers’ markets where they can purchase local produce. As a shopper, once you download the app, you have full access to the vendors at a market. For example, if you are specifically looking for kale, you type your search into Arkitu and it will display all the farmers who are selling kale that night. Based on your location, Arkitu will then draw a line to the vendors with kale, taking you directly to your needs. Founder Sluggett has a vision for progress and growth. Having only launched in January, Arkitu is already active in all five markets in SLO and in four North County markets. He is originally from Oakdale, California, but was drawn to San Luis Obispo. Asserts Cameron: “SLO has agriculture, start-up culture, and technology - the three core things to make this work.” He arrived in SLO last summer to share early ideas about Arkitu at the Downtown SLO Farmers' Market. After hearing his idea, someone approached Sluggett, asking about his affiliation with business incubator SLO HotHouse. However, at the time, Sluggett did not know the HotHouse existed. Intrigued, Sluggett quickly did his research, applied, and was accepted! With a love for farmers’ markets, Sluggett is ecstatic to be in Downtown San Luis Obispo. In the end, all he wants is to help vendors and consumers by creating a more enjoyable market experience for all parties. Download Arkitu (available on iOS) before visiting the Downtown SLO Farmers’ Market and visit Sluggett’s booth while you’re there! Learn more at arkitu.co. 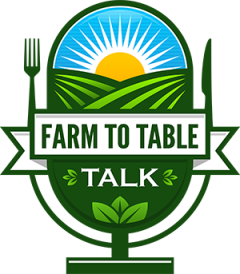 Check it out on farm-to-table talk here. The Tsujita team has done it again. Killer Noodle is a new concept created by the popular Tsujita LA restaurant group. Killer Noodle is the fifth Tsujita restaurant to open in Los Angeles and is located on the same street as Tsujita's Annex and the original Tsujita restaurant. 2017 has been the year of the cauliflower trend and we're not complaining. Cauliflower was bound to get the attention it deserved after simply existing as broccoli's cousin for so many years. This low calorie, low fat, low carb versatile cruciferous vegetable is packed with vitamin C, vitamin K, folate, pantothenic acid, vitamin B6, choline, fiber, and omega-3 fatty acids. The Village Farm is a 12 acre agricultural amenity located at the entrance of Harvest Green - Houston's first agriculture-centered master planned community! Farmers' market food tastes better, simple as that. But that's not the only reason you should start hitting up your weekly market as much as you can. Whether you care about your health or the health of the planet, there are dozens of reasons to support local farmers, including buying vegetables that have higher antioxidant levels and haven't been fumigated with toxic chemicals.